The Warwick Soccer Club (WSC) Pre-Travel Program (PTP) is a bridge between the Recreational Program and the Travel Program. The program is free and open to all talented and energetic U7/U8 boys and girls that want to take their game to the next level and desire to play with others with a similar passion for developing their skills and their love of the game. The program seeks to create a positive learning atmosphere with an emphasis on the development of the player’s technical and tactical skills. Young players need a developmentally appropriate environment that will allow them to first cultivate and grow individual skills, confidence, and motivation. While the PTP functions in a competitive atmosphere, winning is not the foremost focus. With increased proficiency, players will have the ability to compete successfully at an early age as well at subsequent age levels as the team concept and competition gains increasing emphasis for the skilled player. The PTP is the next stage in the development for those children who demonstrate a desire and an ability to be able to play soccer at an advanced level. It is an educational transition from recreational soccer to travel for players and parents. It is a great opportunity for those children who want to step up and commit themselves to learning and achieving more and have the opportunity to play with and against other kids of similar ability and mind-set. with the team shall be beneficial throughout his/her lifetime. Winning and competition are only part of the equation of a successful program or season. Winning is transient, but life skills learned on the field of play and in training sessions are enduring and last a lifetime. Good sportsmanship, physical fitness, goal setting, self-evaluation, problem solving, dealing with disappointment, developing a positive self-concept, and group loyalty are skills and ideals utilized long after a player’s career has ended. To develop every interested player to their full potential. To create a high level training environment. To create a training program that will help develop exceptional soccer players. To develop foundation techniques and foot skills, ball control, trapping, dribbling, passing, and shooting, etc. To develop basic tactical understanding and player movement, spacing, field awareness, ball movement, passing vs. dribbling, dribbling vs. passing, 1 v 1 battles, taking players on, etc. To develop physical elements for soccer and coordination, flexibility, agility, and balance. 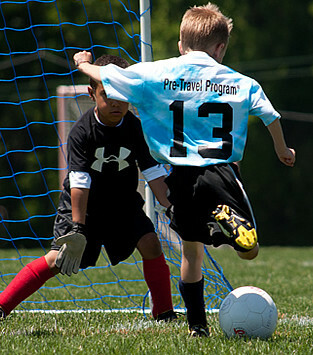 The Pre-Travel Program is in addition to the player’s recreation team practices and games. PTP players will meet each Wednesday during the fall and spring for an hour-long training session. The session will include a professional curriculum focusing on tactical skills and run by WSC coaches. The program is free but registration is required.